Last week, the Cleveland Fed Financial Stress Index climbed to 1.92 (measured as standard deviations from the mean); a level associated with severe financial distress, and previously observed only during the 2011 market retreat, the 2008-2009 financial crisis, and the Asian crisis of 1998. This spike has been driven by widening credit spreads and other measures of systemic market-perceived risk. In 1998, a similar spike shortly preceded the collapse of Long Term Capital Management. In 2008, the spike shortly preceded the failure of Bear Stearns and Lehman Brothers. In 2011, the spike was followed by the failure and restructuring of Greek government debt. In each case, the condition of market internals was the primary indicator of whether these crises would escalate or would be resolved. If market internals were to improve markedly (we’re nowhere near that outcome at present), the immediacy of our downside concerns would ease significantly. Here and now, a measurable spike in financial stress has occurred despite an S&P 500 that is still within 10% of its all-time high, but in the context of wicked overvaluation, poor market internals, and weakness in leading economic data. All of those, as I observed at both the 2000 and 2007 peaks, are features that have historically been associated with market collapses. True to form, Wall Street is increasingly calling for the Fed to move to negative interest rate policy (NIRP) in hopes that the Fed will support the financial markets at current, rich valuations. Understand that the central function of quantitative easing and zero (or negative) interest rate policy is to flood the financial system with base money that someone has to hold at every moment in time, until it is retired by the Fed. That base money never comes “off the sidelines” - it merely changes hands. Provided that investors are risk-seeking, each successive holder tries to pass that base money off to someone else, typically by buying a riskier security that might provide a higher yield (as long as the risk of capital losses can be ignored). The investor who sold that security gets the cash, and the cycle continues. Put simply, when a central bank executes QE in a market where investors are already inclined to seek risk, the excess base money acts as a hot-potato that passes from one investor to another. Given those conditions through much of the period since 2009, investors ignored every valuation extreme, and as we discovered the hard way, they even ignored extreme “overvalued, overbought, overbullish” syndromes that were reliably associated with market collapses in previous market cycles across history. In the face of QE, one needed to wait for explicit deterioration in market internals (indicating that investors had shifted toward risk-aversion) before taking a hard negative market outlook. See, a central requirement for QE, ZIRP and NIRP to have a speculative effect is that investors can’t be too concerned about capital losses. When investors reach for yield, the quiet assumption is that the extra yield won’t be wiped out by a decline in price. That belief may be widely held in a risk-seeking environment, but it fails to hold in a risk-averse one. Once market internals deteriorate in a hypervalued market, conveying that risk-aversion is increasing in the presence of thin risk premiums, the jig is up. That’s why persistent Fed easing was wholly ineffective during the 2000-2002 and 2007-2009 collapses. It’s why we find in the historical data that central bank easing only supports risk-assets when investors are already inclined to embrace risk (see When An Easy Fed Doesn’t Help Stocks, and When it Does, and The Gas Pedal is Useless When the Spark Plugs Are Gone). This is the correct lesson to learn from the sequential bubbles and crashes since 2000, and it’s one that effectively distinguishes those crashes from the intervening speculative episodes. Ignore these distinctions at profound risk. Also, while depressed food and energy prices have held year-over-year CPI inflation to 1.34%, year-over-year core inflation increased to 2.22% in January. That, combined with evidence of rising wages and a relatively low unemployment rate, is likely to be enough to dissuade any shift to ZIRP in the near future. For my part, I continue to view QE and related policies as deranged, economically useless, and lacking both intellectual and empirical footing (other than their potential to encourage speculation under certain conditions). Unfortunately, we can’t rule out move to negative interest rate policy once the recession we expect exerts a more observable impact - not that I think NIRP would help the situation. In the context of unfavorable market internals, our expectation is that such a move would be futile and ineffective in supporting either the economy or the financial markets. In the event of a favorable shift in market internals, we would not be inclined to fight it with a continued negative market outlook. The chart below updates the current valuation picture. The blue line shows the ratio of market capitalization to corporate gross value added on an inverted log scale. 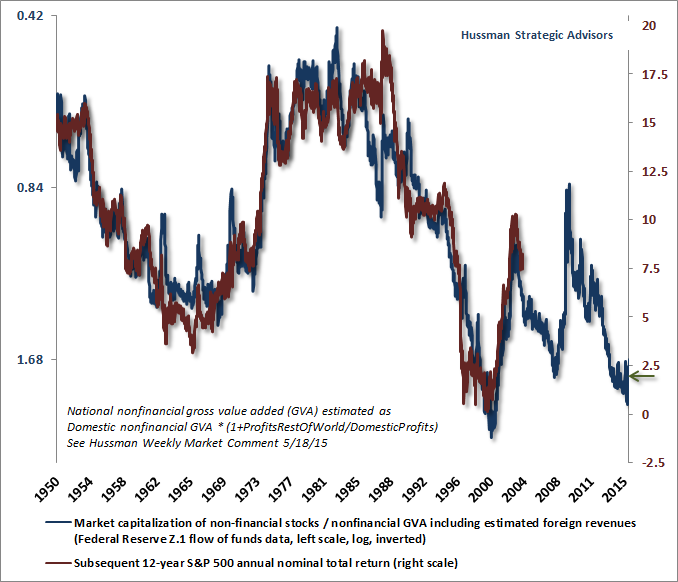 The red line shows actual subsequent S&P 500 nominal annual total returns over the following 12-year period. We associate current valuation levels with likely S&P 500 total returns of only about 2% annually over the coming 12 year period, and zero total returns over the coming decade. Regardless of shorter-term cyclical outcomes, I view this long-term outcome as essentially baked-in-the-cake. With regard to more immediate risks, every notable market crash we’ve observed over a century of market cycles has emerged under the basic combination of overvaluation coupled with a breakdown in market internals. Still what emphatically makes my present outlook a “concern” rather than a “forecast” is that we allow for the possibility that market internals could shift in a way that might convey a return to risk-seeking preferences among investors. I can’t emphasize enough that market internals are the hinge between overvalued markets that advance toward greater extremes and overvalued markets that crash; between weakness in leading economic measures that is followed by economic recovery and weakness in leading economic measures that devolves into recession; and between Fed easing that supports speculation in risk-assets and Fed easing that merely accompanies market collapse (as the Fed’s persistently futile efforts did during the 2000-2002 and 2007-2009 plunges). Presently, a further 40-50% collapse in the S&P 500 over the completion of this market cycle would not represent a worst-case scenario, but rather a run-of-the-mill outcome from current valuations. That prospect is coupled with an expectation of a U.S. recession, and the likelihood that Fed easing will be wholly ineffective in preventing either. Give us different evidence, and the immediacy of our conclusions will change. I use the word “immediacy” because valuations speak to long-term returns, not returns over shorter portions of the market cycle. Over shorter horizons, the primary driver of market fluctuations is the willingness or aversion of investors to embrace risk. Since investors tend to be indiscriminate when they are in a risk-seeking mode, we find that the most reliable measure of that risk-seeking is the uniformity of market internals across a broad range of individual stocks, industries, sectors, and security types, including debt securities of varying creditworthiness. Give us an improvement in those internals, and despite what we view as extreme valuations where dismal long-term returns are baked in the cake, the immediacy of our downside concerns would be reduced. 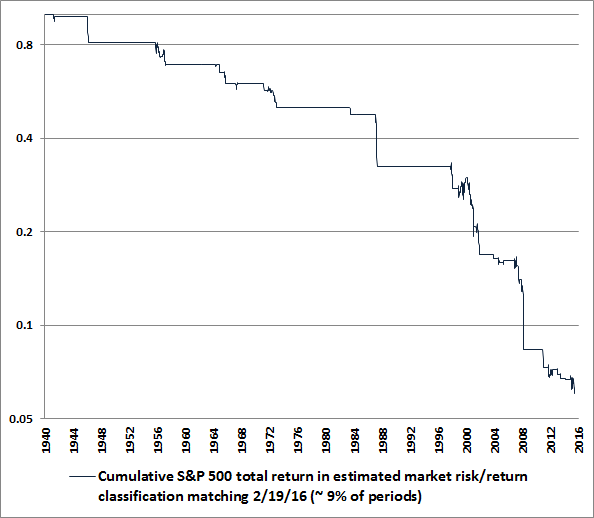 The chart below shows the cumulative total return of the S&P 500 under the same estimated market return/risk classification that we observe today. I should note that this market return/risk classification includes the adaptation that we introduced in mid-2014, which requires explicit deterioration in our measures of market internals as a requirement before taking a hard-negative market outlook. If you’re not familiar with that narrative, see A Better Lesson Than “This Time Is Different” and the Box in The Next Big Short: The Third Crest of a Rolling Tsunami. I’ve thinned the line quite a bit in order to show short-term movements in greater detail. The chart is on log scale. Clearly, the current market return/risk classification isn’t always associated with near-term market losses, but vertical declines are frequent, and the cumulative market loss captured by this roughly 9% subset of history is about -94%. This also implies that all other market conditions across history capture a cumulative S&P 500 total return about (1/.06) ~ 16 times the overall total return of the index itself. Bottom line, I recognize that market crashes are outliers, and I should emphasize that present conditions don’t imply the forecast of a market crash. But based on specific conditions that have historically been permissive of deep market losses, investors should certainly be braced for that possibility. I honestly don’t know how to look at the historical evidence currently in hand and say something different. I’ve certainly made my own mistakes in the half-cycle since 2009, and I’ve articulated the central lesson nearly every week since making what I view as the critical adaptation in mid-2014. Those (fully addressed) challenges aside, the conditions and concerns we presently observe are identical to what I expressed at the 2000 and 2007 peaks. Understand that I have no argument with investors who have both the investment horizon and the risk-tolerance to maintain a passive investment strategy. While my impression is that the completion of this cycle may be quite similar to what passive investors had to accept during the 2000-2002 and 2007-2009 market declines, disciplined passive investors recognize the potential depth of those cyclical risks. But they also recognize the potential imperfections of any attempt to actively manage those risks, and decide to follow the passive route. For my part, I prefer following a value-conscious, historically-informed, risk-managed approach, and likewise, I have to accept the periodic risks of that approach (which in the recent half-cycle was mainly that - so long as market internals had not explicitly deteriorated - deranged monetary policy weakened the reliable historical tendency for extreme “overvalued, overbought, overbullish” syndromes to produce abrupt losses). I’d like to end with some personal thoughts. If you’re an advocate of a passive buy-and-hold strategy, you’re not my enemy, and neither should I be yours. We simply see the world differently. It’s strange to me how much intolerance has infected every aspect of our culture. As meanness and incivility become increasingly acceptable, I think it’s best to push the other way. Incivility is like a broken window - when it becomes acceptable, you get more broken windows, and everything deteriorates. I’ve laid out our concerns and our evidence, and we’re going to do what we’re going to do. To my critics - disagree as you like, but be kind, lest you invite ridicule when the tables turn. Speculative half-cycles, after all, tend to be completed badly.